Taking its architectural cue from the covered bridges of the American South, Hotel Indigo Athens elevates the downtown cityscape of “The Classic City.” Pairing Southern farmstead modern style with a deep appreciation for local culture, this boutique retreat – one of the world’s first LEED Gold-certified hotels – charms UGA parents, environmental enthusiasts and visiting musicians with its stellar service, Southern style and art-centric spaces that shine with originality. Join our VIP Parents program for discounts and special perks and privileges throughout the year. It's never too early to start thinking about graduation! After all, with more than 35,000 undergraduate and graduate students on campus, Athens bustles every year with newly minted Bulldog grads and their proud families. Indigo is your home base for UGA home games! Our Game Weekend packages include room, welcome revelry and more. This was my favorite of the three hotels from this trip. The room is very well laid out and stylish. The bed is incredibly comfortable. The bathroom is very sleek and modern, with delightful Aveda products. I would definitely return. From service to perfectly appointed rooms, this is how you do hotel. 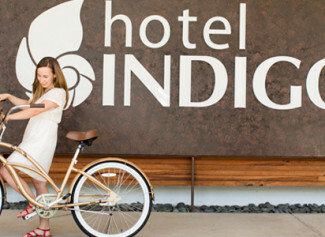 Hotel Indigo is a great concept in the hotel industry and this hotel in Athens is a perfect execution of a great concept. The Athens Hotel Indigo is the only place I'll stay in town. Stayed three nights for a conference. Room was very nice, clean, and comfortable. Staff was very nice and helpful. Short walk to downtown area. The bar was nice and the outside space was great. Will stay again when in Athens. The hotel was wonderful! modern and clean but yet super comfortable. The Staff were all friendly and helpful and you are close to many good restaurants and hot spots. I would stay there again and I highly recommend it to others traveling to Athens! Come one, come all to Athens Craft Beer Week—going on now through April 7!